On a warm summer Sunday, we weren't surprised to run into people just trying to make it to Sandy Hook. What surprised us was how long ago they'd started their trip and the massive delay they suffered -- maybe New Jersey's first huge traffic jam. Certainly, it was the biggest hassle anyone has experienced in trying to get to the shore. We'd started the day avoiding all things beach. In fact, we were at a sod farm in eastern Mercer County, looking for 'grasspipers' - a general description of the shorebirds that hang out in grasslands. The fields weren't quite as productive as we'd hoped, leading us to wander a bit aimlessly until we found ourselves in the western Monmouth County community of Allentown. Full of Colonial, Georgian and Federal-style buildings dating to the earliest days of the nation, Allentown was built around an old grist mill on Doctors Creek. A picturesque mill pond offers a nice focal point to downtown and, of course, is irresistible to intrepid birders. The part downtown isn't quite so interesting -- it's the part that extends back to the residential areas that's tempting. Finding the right road wasn't hard -- it's called Lakeview Drive. Before we got to the lake, though, we noticed an old graveyard by the side of the road. 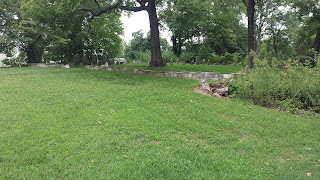 The landscape is well tended, the grass is short, but its old stone border wall has seen better days, and its grave markers are well worn. In a lot of ways, it's not much different from any number of other small cemeteries dotting the more remote areas of New Jersey. Not exactly a rest area, but sufficient for the need. What got our attention was a shorter stone flanked by two American flags. According to the plaque affixed on top, we'd stumbled on the pit stop for somewhere between 10,000 and 15,000 travelers who were just trying to get to the shore during some of the hottest days of June. This seeming horde of Bennies weren't headed to sun, fun and maybe some debauchery on the Boardwalk. They were members of what was acknowledged to be the best trained fighting force in the world: the British Army of 1778. Led by General Sir Henry Clinton, the troops had left Philadelphia and were on their way to the British stronghold of New York at Manhattan. Originally, the plan had been to evacuate troops via ship down the Delaware River and around New Jersey northward, but a shortage of transports forced a change of plans to an overland route. Crossing the Delaware, the troops moved in a northeasterly direction through Mount Holly and beyond. The trip was arduous. Heavily encumbered by a 12-mile long wagon train of equipment and supplies, the Brits and had been struggling to make their way despite demolished bridges and harassment by local Patriots. Even nature seemed to be conspiring against them: thunderstorms, mosquitoes and oppressive humidity made the trek especially onerous. After encamping at Allentown overnight, Clinton decided to direct his troops toward Sandy Hook. It was a logical move: the British had captured the peninsula over a year before and fortified it against attack, though Patriots occasionally attempted raids to disable Sandy Hook Lighthouse. Several British naval vessels were usually stationed offshore as further protection, and from there, safety in Manhattan was just a reasonably short sail away. Clinton and many of his troops eventually made it to Manhattan, but not without a serious fight, and that's an understatement. General George Washington, seeing an opportunity to strike, advanced the Continental Army to confront the British at Monmouth Court House - present day Freehold. The battle that ensued on June 28, 1778 was the largest artillery battle of the American Revolution and one of the longest engagements of the entire war. Consider that the next time you're stuck in shore traffic. For many years, New Jersey had the reputation of being the home for corporate headquarters. It seemed that if you were a Fortune 500 company, you either located your CEO here or had a major installation somewhere in the state. Some of them moved here from more expensive digs in New York City, finding good transportation routes and pleasant suburbs to attract employees. In any case, it wasn't hard to pick out the corporate HQs dotted along our highways, with their sprawling lawns and low-slung buildings. Curiously, as I discovered recently, one of the largest and most famous among them had much more modest digs on a small lot in Flemington. You might know that corporation as ExxonMobil. Back then, it was Standard Oil of New Jersey. To say that the history of Standard Oil is complicated is a vast understatement, and I couldn't hope to explain it all in a readable blog post. For the purposes of today's story, what you really need to know is that at one point in the 1930s, the corporation's headquarters technically was a lawyer's safe on Main Street in the Hunterdon County seat. John D. Rockefeller's oil behemoth was broken up in a 1911 Supreme Court antitrust ruling, with Standard Oil of New Jersey (or Jersey Standard) being the largest of the resulting "baby Standards." Operating refineries at Bayonne and Linden, it continued to evolve after the mandated breakup, making several acquisitions and eventually becoming the world's largest oil producer. Flemington has never been known to be a big oil town, nor has there ever seemed to be a potential for anyone to strike black gold somewhere off Route 31. And, in fact, there doesn't seem to have ever been a Standard Oil office anywhere in town, except maybe for a desk and chair at a filling station. This was not a traditional arrangement by any means. As you might have already guessed, the company's reasons were purely economic. In one word, taxes. New Jersey law at the time stated that a company was headquartered where its incorporation papers were housed. By moving its headquarters from Linden to Flemington in 1937, Standard Oil was able to shave its tax bill by 80 percent. The company's operations continued without missing a beat. Exxon corporate histories say nothing about this move to the heart of New Jersey's farm country, though I guess it's not surprising. The fact that the company had previously moved its headquarters to Linden from Newark to save a half-million dollar tax payment leads me to believe that the stay in Flemington was a relatively brief one, lasting only until a more attractive tax haven could be identified. Despite Standard Oil's penchant for bending the rules, it's likely that its new neighbors in Hunterdon County wouldn't have minded a bit that the company had done this bit of corporate legerdemain, if they even knew the move had occurred. The boost in revenue to the county meant their own tax bills would decrease. While no new jobs were created, nor was there any additional burden placed on local roads and utilities. Maybe they hadn't struck oil, but who ever complained about lower taxes? When I was in the fourth grade, my teacher gave me a project that opened my eyes to the diversity of our state. Everyone in our class had to write a report about a randomly-assigned county in New Jersey and present it to our fellow students. With 21 kids in the class, we were all guaranteed to learn about areas of the state we knew little of. I got Hunterdon. Hunter-who? Clear across the state from my Union County home, I'd never heard of it. Dutifully, I sent a letter to the courthouse in Flemington, wondering what this far-off place had in store for me. A few weeks later, I got a big manila envelope from the Hunterdon County clerk, loaded with pamphlets chock-full of facts and figures. While some of my classmates had gotten pretty tourist brochures featuring shore locations or historic sites in their assigned counties, the data-laden Hunterdon literature made one thing very clear: the county was where food comes from. And it was big business. I was reminded of this recently as Ivan and I wandered just a block off Main Street in Flemington and came upon an office building labeled "Old Egg Auction Prestigious Offices." With a liberal number of rooster statues strewn about, the building clearly had been repurposed after an industrial past. A county historic marker told the tale: "FLEMINGTON EGG AUCTION. 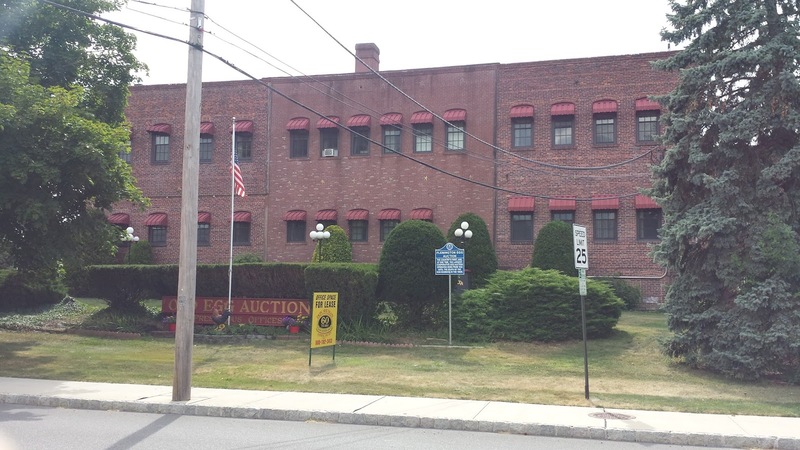 The country's first, and, at one time, the largest cooperative egg auction operated here from 1932 until the death of the egg business in the 1960s." The "first and largest" fit perfectly with my childhood impression of Hunterdon County, but what was this about the death of the egg business? Isn't that just a little dramatic? I mean, I'd had a Taylor ham, egg and cheese that morning for breakfast. Obviously, this warranted a bit more research once we got back to Hidden New Jersey headquarters. Our usual sources gave but a hint of information. Published a few years after the auction's founding, the Flemington chapter of The WPA Guide to 1930s New Jersey noted that the auction had started in 1930 to ensure the county's poultry farmers could attract better prices for their wares than they presumably could by seeking buyers independently. 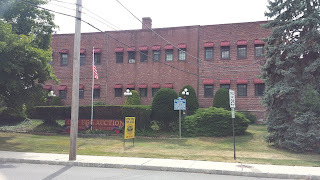 More research revealed that the auction had operated from the basement of one of the downtown stores before moving to a Park Avenue factory that had once housed the Empire Glass Company. Not long afterward, the Flemington Egg Auction expanded to live chickens and other livestock, eventually becoming a model for other agricultural cooperative auctions around the country. That was just the start. These days, the big Mid-Atlantic chicken states are Delaware and Maryland, but poultry was big business for New Jersey in the early- and mid-20th century. More than 1200 egg and livestock producers participated in the Flemington Auction in the late 1940s, and Hunterdon County wasn't even the largest poultry producer in the state. By 1956, sales of meat chickens and eggs accounted for nearly a third of all farm cash receipts, and we were fifth among all states in egg production. The Egg Auction alone was pulling in about $2 million a year. Not long afterward, the tide turned, as oversupply and grain prices led egg producers out of the marketplace. Undoubtedly, improved transportation systems made it easier for lower-cost southern factory farms to ship fresh product to New Jersey at competitive prices, too. Maybe the egg business didn't die, but its New Jersey division wasn't doing very well. Farmers around the state, Hunterdon included, were discovering their land was worth more to developers than it would ever be if they continued producing eggs. Starved by a lack of suppliers, the Flemington Auction closed in 1976. 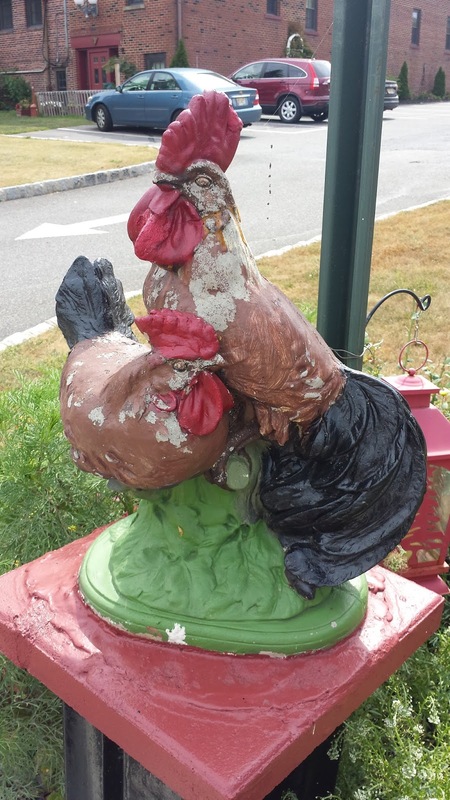 Its property festooned with painted rooster statues, the Old Egg Auction building got us thinking about evolution -- not just the fate of the egg industry, but the old chicken-and-egg question. In Flemington, the egg was clearly sold at the auction before chickens ever came before the gavel. Will it ever come back to roost? That's a debate for another day. I've long been of the mind that keeping a historic building in continuous use is the best way to keep it from deteriorating. An impressive structure on West Broad Street in Bridgeton proves that sometimes, the direct opposite is true. Standing on a full city block along the main road, surrounded by scattered gravestones from the late 18th century to the present, the Old Broad Street Church owes a good part of its fine condition to the fact that it was largely abandoned in 1836, just over 40 years after it was built. According to the church's website, it may be the most pristine example of Georgian high ecclesiastical architecture surviving in the thirteen original states. We visited on a recent Sunday afternoon, when the congregation generously opened the doors to a curious public. 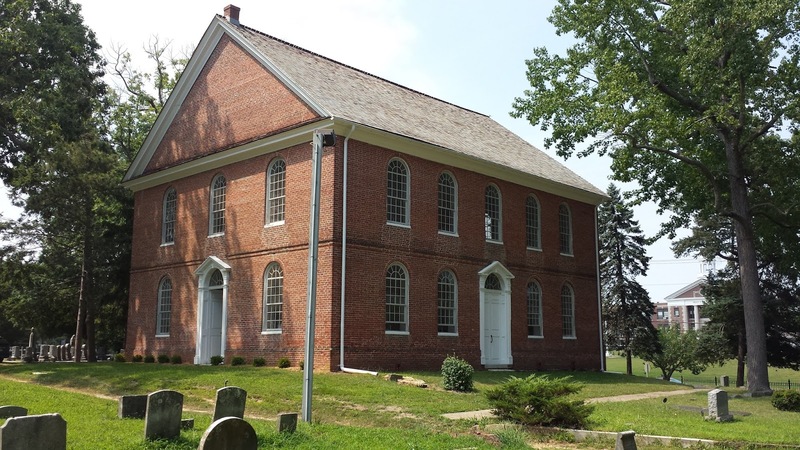 From the outside, the two-story brick building appears both stately and simple, designed in the manner of the Philadelphia churches of the day. Doors on three sides of the rectangular church welcome visitors; curiously, the only side without a door is the one that faces the road. One of the side doors was open, and as we walked past, I noticed what appeared to be a metal beam running from a metal box diagonally up to the ceiling. Was this some sort of reinforcement, added during a restoration attempt? Hopefully we'd find out. seats? Photo courtesy Library of Congress. Walking inside, we were welcomed by a member of the friends organization, who gave us a brief history of the church, the first Christian congregation organized in Bridgeton. Its original members had been worshiping at far-flung churches and wanted their own meeting place in the growing town. 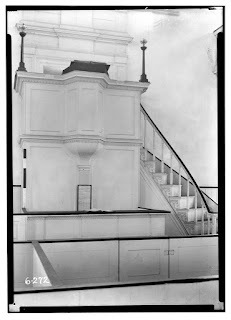 By 1795, they had their own church, complete with box-style pews. The more prosperous congregants usually purchased pews closest to the front of the church, but as our hostess observed, prominence may have come with a cost. Sitting so close to the elevated pulpit, the rich folk had to strain their necks to see the minister in his elevated pulpit. Meanwhile, the view from the back pews was just fine. The building's simplicity reminded me of a lot of Colonial-era Presbyterian churches I've visited, but unlike those, I could easily imagine early Americans sitting in Old Broad's pews to worship. Instead of wood floors, this church had brick, and the white paint on the pews both looked and felt sturdier -- more durable -- than what you usually see in a building that's been converted to central heating. The only concession to weather extremes is that curious metal contraption I'd noticed earlier, a two-stove and piping system constructed at nearby Atsion and installed in 1809. No other modernization has been done to the building since then: no plumbing, no electrical work, no mechanical systems. This plaster medallion adorns the center of the ceiling. 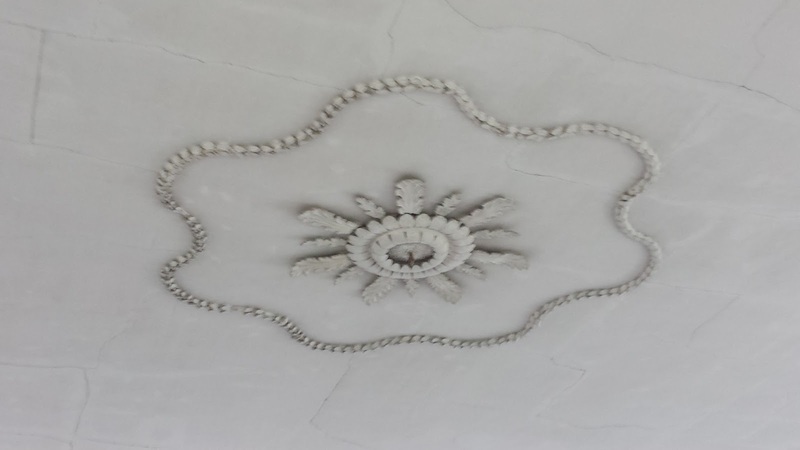 It's a wonder the ornate plaster ceiling details have lasted so long, given the lack of climate control. That said, the absence of complications like plumbing and a constantly-working furnace may be what saved it. Uneven heating and leaky pipes have been the downfall of countless neglected historic structures. As our hostess shared the history of the congregation, another docent told us we absolutely had to check out the balcony level, especially the east side. Religion had been part of the curriculum at the local school in the early 1800s, so students were brought to the church for instruction. Separated by gender, the girls sat in the western balcony, the boys opposite. How can we know for sure? The wood of the western pews is pristine, while those on the east are marked with carved initials and names. Come to your own conclusion. So why was the church abandoned so early in its history? The growing city's population shifted eastward in the early 19th century, and Presbyterians understandably wanted to worship closer to home. They built a new church on the east side of town and left Old Broad Street. As will happen over time, the congregation has seen splits and mergers over its 230 plus year history, but they haven't forgotten their roots. 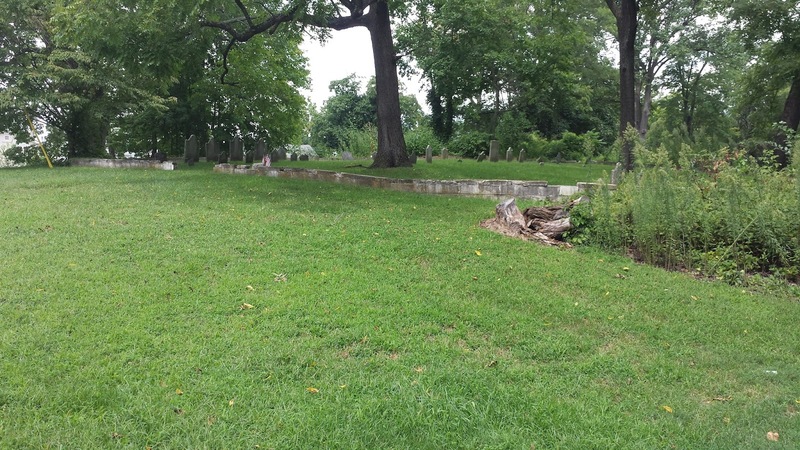 Family plots in Old Broad Street's sizeable churchyard still take in new burials, adding to more than 10,000 graves that include resting spots of several members of Congress, New Jersey Governor Elias Seeley and a good number of veterans of the American Revolution and the Civil War. The living are welcome, too, just a little less often. The doors of Old Broad Street open for worship during August and a special service on Thanksgiving Day. And if you're lucky, as we were, you'll happen by when they're having an open house. Between the truly striking architecture and the welcoming spirit of the church's friends and congregants, you'll be glad you stopped by.